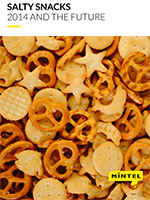 This global annual market overview will provide you with an in-depth review of the key issues in the global salty snacks market through 2014 as well as our forecast for what will happen in 2015 and beyond. The salty snack market runs the gamut from universally loved products such as potato chips to items with a distinctly regional audience, such as seaweed or pretzels. As consumers have become more sophisticated and global in their eating habits, their snacking horizons have also expanded, and the lines between regional snacks are blurring. China led in salty snack sales in 2014; and was one of the fastest growing as well, topped only by India. Per capita consumption of salty snacks is highest in the US, significantly more than its closest rival, Canada. Considering the high obesity levels globally, there is a considerable amount of attention being paid to the salty snack category as consumers – and marketers – struggle with the balance between health and indulgence. The balance between healthy and indulgent seems still to be a challenge. Only 3% of new products across the salty snack spectrum were positioned as low/no/reduced sodium and the same percentage claimed low/no/reduced fat, suggesting that better for you (BFY) products are not gaining ground to the same extent as are full flavoured “regular” items.